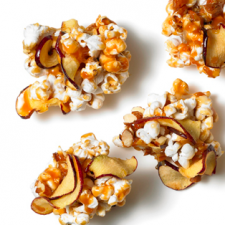 In celebration of fall, I decided to whip up a tasty treat this weekend – Caramel Apple Popcorn. Oh my, I can’t begin to tell you how good this was! I’m a big fan of anything caramel and I also absolutely love flavored popcorn. This is the type of snack that once you start; it’s so hard to stop. My main ingredient in this addicting treat was coconut oil. This was substituted in place of butter and definitely increases the flavor of the ingredients. I used coconut oil for the homemade caramel and also when making my apple chips. Now, a lot of these ingredients you can get store bought, but I chose to make everything from scratch. If you’re on a time crunch or just want to pick the quick way, go the store bought route. This recipe did take some time because of the process with making the apple chips, but I do enjoy baking, so it’s something that I didn’t mind. Preheat oven to 250 degrees. Line baking sheets with parchment paper or foil. Cut apples into extremely thin pieces, about 2 centimeters in width. Evenly spread apples on lined baking sheets and drizzle melted coconut oil over the apples. Place apples in oven for 1.5 to 2 hours, turning apples every 25 minutes. Once apples are dry and crisp, remove from oven and place on a cool surface. Fill brown paper bag with kernels. Fold bag over 3 or 4 times. Place bag upside down in microwave, making sure it is steady so it doesn’t fall over during microwaving. Microwave for 3 minutes or until you hear the kernel popping slow down to about 2 seconds between pops. Add in baked apple chips, tossing to get an even amount within the popcorn. Set aside and wait until the caramel step is completed. In a sauce pan, mix Kelapo Coconut Oil, brown sugar and honey over medium heat – stirring constantly. This step is very important. Once all ingredients have mixed together and you achieve a dark brown, thicker consistency, remove caramel from stove. Immediately pour caramel over your popcorn mixture. With a spatula, fold popcorn in order to coat evenly. Feel free to sprinkle a mixture of cinnamon and sugar or pumpkin pie spice for added flavor! You can even drizzle more melted coconut oil over the finished popcorn if desired. Get creative and add in your own favorite mix ins, such as pecans, almonds, or even more dried fruit – SO good!